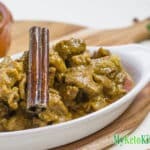 This Indian keto recipe is our Low Carb Nut-Free Lamb Korma Curry, a mild dish with a lovely blend of spices. In a small bowl, measure out the garam masala, ground ginger, coriander, cumin, kashmiri chili and turmeric, and stir to combine. In a large saucepan place the ghee and heat over low heat. Add the onion mixture and cinnamon stick and saute over low heat for 10-15 minutes until translucent and beginning to caramelize. Increase the heat to medium and add the diced lamb. Saute until browned. Add the spice mixture and stir to coat the lamb. Add the cream and water, stir well and bring the saucepan to a simmer. Drop the heat to low and half cover the saucepan. Simmer, stirring occasionally for 2 hours. The sauce will reduce just below the meat. If the saucepan is becoming too dry add another ½ cup of water. Add the salt, pepper and yogurt and mix well. Continue to simmer for another 10 minutes before removing from the heat. Serve with Indian Cauliflower Rice.